Wheelersburg’s McKailyn Wamsley (24) and Minford’s Aurie Coriell (3) fight for control of the ball. Minford’s Erin Daniels (14) and Ali Brumfield (2) battle for the ball with Wheelersburg’s Madison Humble (13). 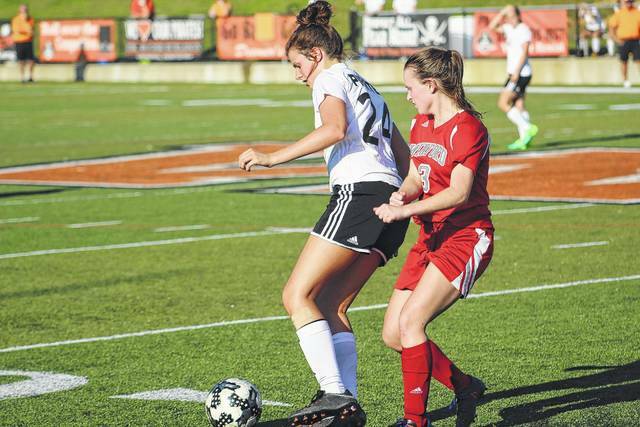 The Wheelersburg Pirates and the Minford Falcons met on the turf at Ed Miller Stadium in Wheelersburg on Tuesday evening for a hot, high stakes SOC match. The Pirates entered the game at 11-0 and 4-0 in the SOC, along with a 21 game SOC win streak and a 41 game regular season win streak. Still, they knew that Minford could pose a threat to their unbeaten regular season. Tieman’s Minford bunch were able to hang tight through a large portion of the game with the score locked even at 0-0. 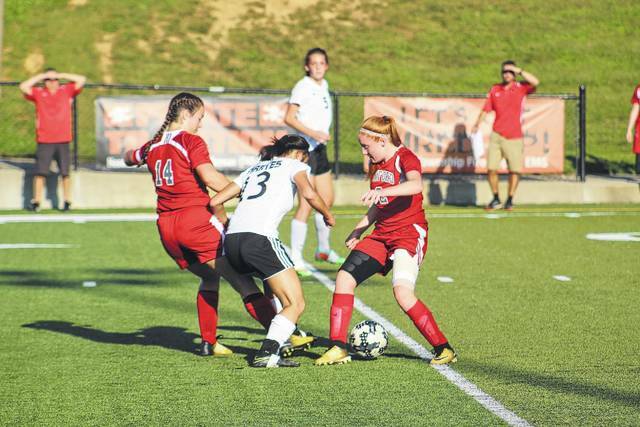 Wheelersburg didn’t score until there was only 14 minutes left in the match, and added another goal with eight minutes to play to secure a 2-0 win. The Pirates had several opportunities in the first half, but were unable to capitalize on their chances. Minford’s defense was nearly as sweltering for the Pirates as the 90 degree temperatures on the field. Wheelersburg’s best scoring chance came late in the first half, when Christen Risner found Libby Miller on a nice pass, but Miller missed just high at the 14 minute mark. That connection of Risner and Miller, as well as Humble, were held in check in the first half. Yet, Minford was unable to keep them locked up for the entire duration of the game. At halftime, Wheelersburg and Minford were tied at 0-0. With 26 minutes remaining in the second half, Minford had a big opportunity on a penalty kick. The shot was perfectly placed to the left corner of the goal, but Wheelersburg keeper Morgan Bivens made a huge stop to keep the game scoreless. Without a doubt, the save changed the perspective of the match. When asked if the stop had a big impact on the final outcome, Jarvis shook his head in agreement. Humble nearly got on the board with 24 minutes to go in the second half, but just barely missed wide on her attempt. Ten minutes later, she made up for her miss when she was fouled and given a chance for a penalty kick. Her shot was placed perfectly. It bounced off the bottom of the goal bar, and narrowly crept in to put the Pirates on the board. With 14 minutes left to play, Humble and Wheelersburg held a 1-0 lead. Then, with eight minutes to play, Risner found Miller again. This time, Miller found the back of the net when she pulled the trigger, putting the Pirates in front 2-0. The Miller score was the last of the game, and just enough to give Wheelersburg the win. The offense woke up late for the Pirates, but Jarvis says the defense was the reason Wheelersburg came out on top. For Wheelersburg, the focus has shifted to Saturday’s game with Alexander. “The great thing about this team is we’ve progressed one step at a time and we worry about the very next opponent,” Jarvis said about his group, who is now 12-0 this season. Minford will take on Portsmouth West at home on Thursday night.